Although we are small, what we do is important. Our mission is to bring real tea - directly from the Source - to everyman on the street. 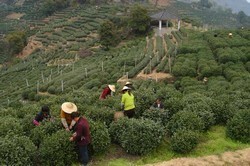 We would like to think we are your bridge to famous tea villages, where century-old tea traditions and pristine natural conditions are well and alive. The tea farmers are wonderful people. They are my teachers and experts, so passionately proud of their cultural heritage. They live and breathe the mountain air. Their eyes twinkle when I tell them how much you enjoy their teas. What we do is really quite simple. Both I and HQ taste their teas. When we think we spot a star - something we think you would be extremely pleased to have - we place a large order as soon as the harvest finishes. We pack the teas into air-tight bags; leave them in freezer until your orders come in. We believe in integrity, honesty and efficiency. We believe in acting smart to create a win-win situation for consumers, growers and the environment. We would only sell a product if it makes this world a better place to live. So far, judging from the relatively large number of feedback I receive, what we do seem to make sense from your point of view. So we are happy with what we are doing and intend to do so for a long time to come.